Simone Ritter Art: 1994 Airstream Excella- Let's Get Started! First Camper of the Month is: tataaaa...(think drumroll)... this 1994 Airstream Excella! It was parked as a wonderful surprise at our local campground and just looked so nice that I asked the owner how long they were staying and also, if I'd be allowed to do a painting of their beauty. It is 25 ft long and fairly new to the owners. I hope they will enjoy a lot of fun times with their Glampie-campie. This is a photo of the work-in-progress while I was creating this painting a few days ago. 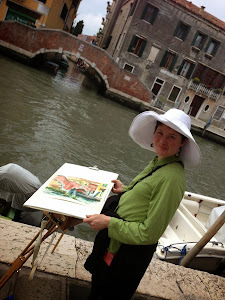 I painted 'en plein air', meaning on location outside. 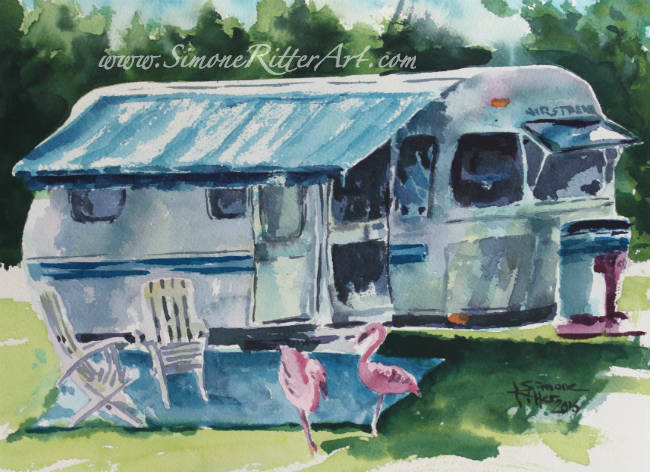 I love painting on location, as it sharpens my skill to see proper light and low values, colours and more so, I need to work quickly as the changing location of the sun changes the shadows, reflections and colours in a scene, especially here where there are a lot of reflection on the aluminum body of the camper. Thank you all that have submitted photos already- there is still room for more- please send your sweet photos in! You can submit by going here.